The established presence of Islam in the region that now constitutes modern Turkey dates back to the latter half of the 11th century, when the Seljuks started expanding into eastern Anatolia. According to religiosity polls, 97.8% of the population identifies as Muslim, and only 2% is non-religious.Most Muslims in Turkey are Sunnis, forming about 73% of the overall Muslim denominations. The remaining Ithna’ashari-Shia denominations consist of the Alevis forming about 10-15% of the Muslim population, Ja’fari community representing 4% of the overall population and an Alawite community with an estimated population of around 1 million which is about 1% of the overall Muslim sects in Turkey .The urban landscape of Istanbul is shaped by many communities. The most populous major religion is Islam. 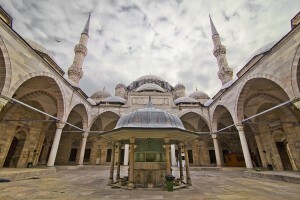 The first mosque in Istanbul was built in Kadıköy (ancient Chalcedon) on the Asian side of the city, which was conquered by the Ottoman Turks in 1353, a full century before the conquest of Constantinople across the Bosphorus, on the European side. The first mosque on the European side of Istanbul was built inside the Rumelian Castle in 1452.